It’s that time again! We’re reviewing our antiques and home decor blog posts from 2015 and it’s very hard to pick just a dozen of the most popular stories of the year. Before we start, we’re grateful for all our good news this year. We received many honors from Houzz.com including a Best of Houzz 2015 award for customer satisfaction and service. Our upcycled vintage spoon chandeliers were featured on a TV show and we expanded and beautified our booth at the Antique Tobacco Barn in Asheville, NC. There’s more good news too, but let’s look at the first six of our favorite 12 antiques and home decor blog posts of 2015. We’ll share the rest in our next post welcoming the new year. 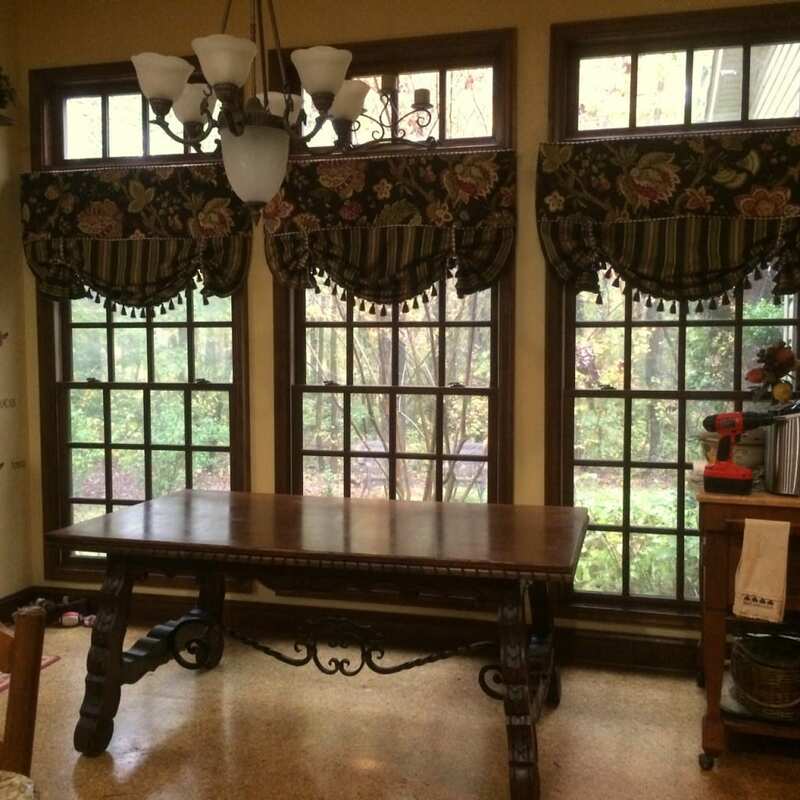 We always appreciate customers who return to us to buy antique, vintage, and new furniture and home decor accents, and then send us photos for our series of client spotlights so we can see how their purchases look in their home! 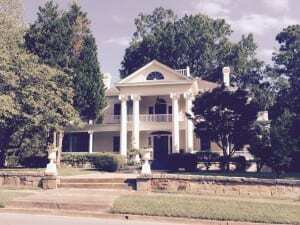 Of the many that stand out from 2015, one is this gorgeous mansion filled with antique furniture chosen by our customer Tamra. 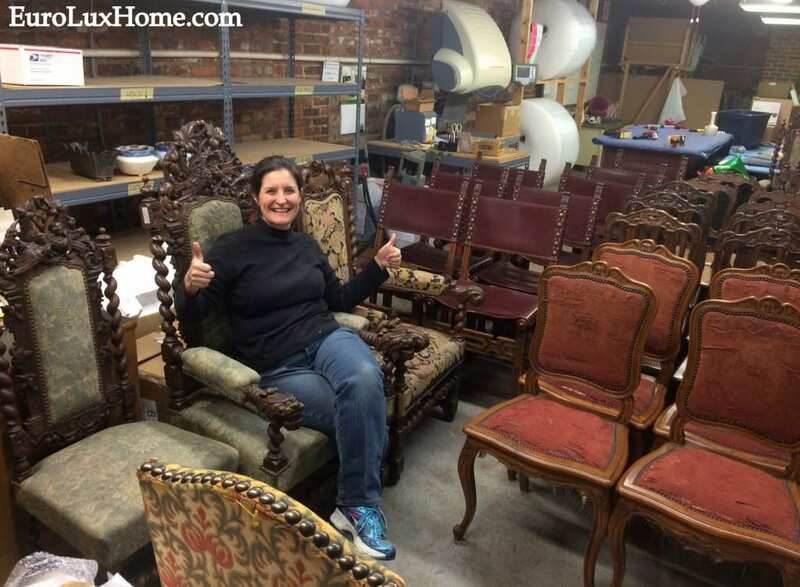 In the blog post about the Newberry Mansion you’ll see the inside tour with pieces Tamra bought from us including a French Country table, antique Hunting chairs and antique Mechelen buffets. The story about the 1950 vintage French Sheepbone chairs in Veritta’s home in California was also a happy one for us because Veritta said she bought her dining table 10 years ago but she has been waiting all this time to find the perfect chairs! See for yourself how right she was to wait for the perfect match, and also find out about the carved sheepbone style and why it’s named that way! In our ongoing saga about the renovation of our 1920s vintage bungalow, we made sure we created a special space for the cats too! Our story and photos about our cat porch was one of the most popular posts this year. 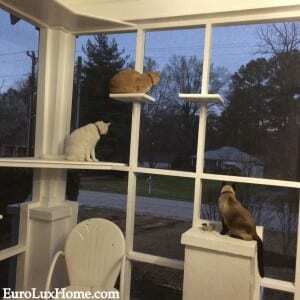 Everyone enjoys sitting in this “cat paradise” screened porch. Since then we also adopted a new little tiger cat, Pumpkin to join our family of (now) 9 cats and dogs. Meet her and read about how Pumpkin arrived during Hurricane Joachim. Just in time for Valentine’s Day I took a virtual trip to Romantic Victorian Inns around the country. These four inns are great for a romantic getaway at any time of the year. 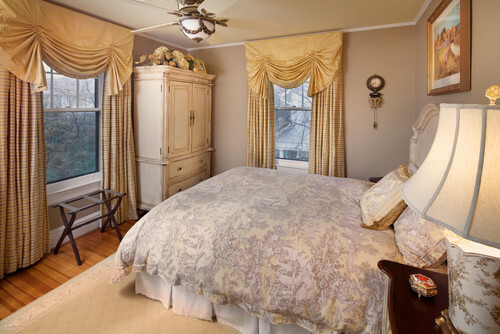 The inns are decorated with period Victorian or Victorian style decor, adding to the charm of your stay! Tying in with the Hollywood Regency trend and the always-popular Art Deco look, I took the opportunity to shine a light on Decorating with Mirrored Furniture. As you’ll see in the story, mirrored furniture can be subtle, it doesn’t have to be a bling-fest. Sophisticated new or antique mirrored furniture not only looks sleek and luxurious, it can also create clever illusions to brighten and expand a room. I enjoyed putting together this series on how to display a collection. It gave me the chance to explore the very creative ways different people organize and display their ceramics, jewelry, and other collections from vintage model trains to classic cameras. Later, we also had a chance to show off my mother-in-law Kathy’s huge collection of pilgrims and other Thanksgiving-themed objects. You can see Kathy’s impressive collection of more than 700 pieces at the link. I hope these highlights of the year provide you with some inspiration or just a little fun as you browse through. Happy new year everyone! If you enjoyed this, see the rest of our picks for the year! 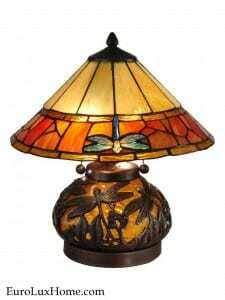 Here’s the link for the Part 2 final six of our top 12 decor and antiques blog posts of 2015. 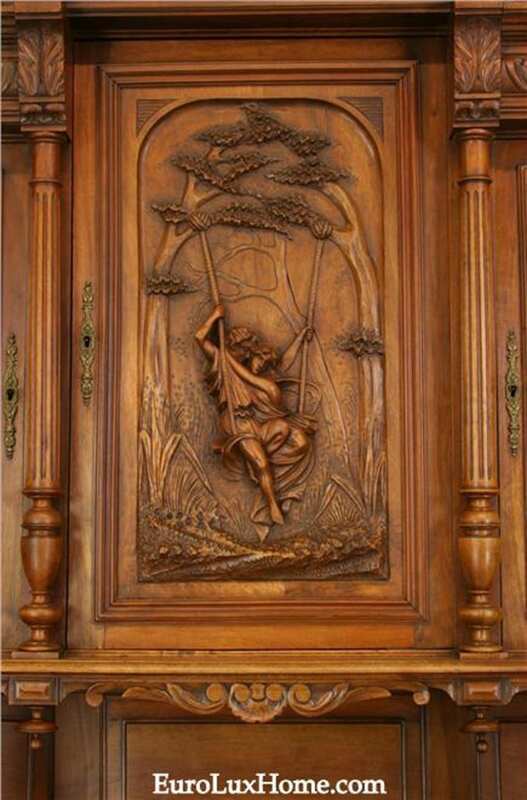 This entry was posted in Antique Furniture, Home Design Ideas and tagged antique French furniture, Antique Furniture, Antiques Blog, interior decor, interior design, living with antiques on December 30, 2015 by admin. Paint Color Decor Trends 2016: Whites Win! While last year’s paint color trends were quite bright and bold, for 2016 many of the big paint companies are turning to a serene state of mind and picking dreamy shades of white! Of course, we’re not all going to strip the paint off the walls and redecorate just to please the paint companies. Still it is interesting to see how similar the colors are this year and the reasons given by the paint companies for choosing these classic whites are all the same too: to create a tranquil sanctuary away from our fast-paced world! 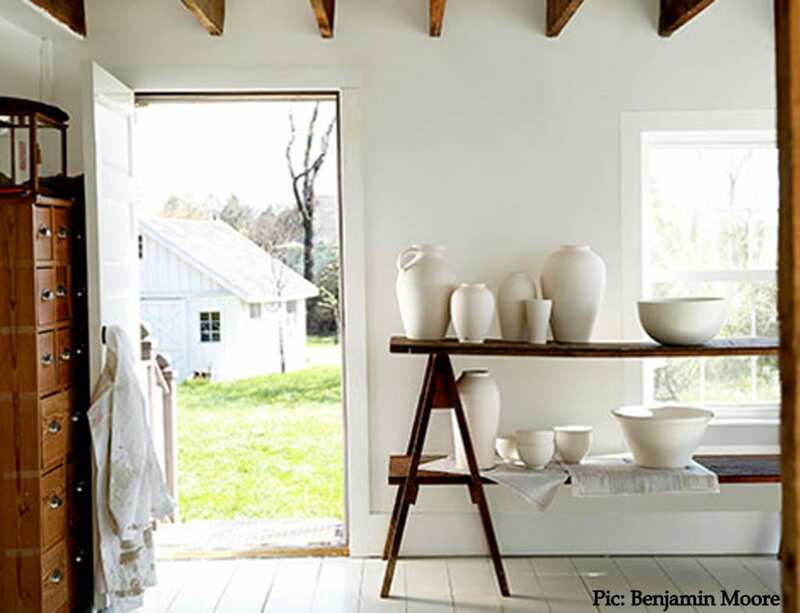 Benjamin Moore nominated Simply White as their 2016 Color of the Year. This photo shows how beautifully the layered white tones diffuse light and create a sense of peace and harmony. These white-washed walls make a gorgeous backdrop for the richly toned wood furniture and hand-hewn beams. Sherwin-WIlliams chooses Alabaster (SW 7008) as Paint Color of the Year for 2016. It is a symbol of new beginnings but the main reason cited by Sherwin-Williams for giving Alabaster a place on the pedestal is as an escape from the noise of the modern world. “Alabaster offers a sense of personal solace and revival to weary minds. It is the true neutral to set the tone for 2016.” It certainly looks graceful in this living room, and the mirror, glass, and silvery reflective surfaces all add to the light and luxurious feeling created by the Alabaster white. 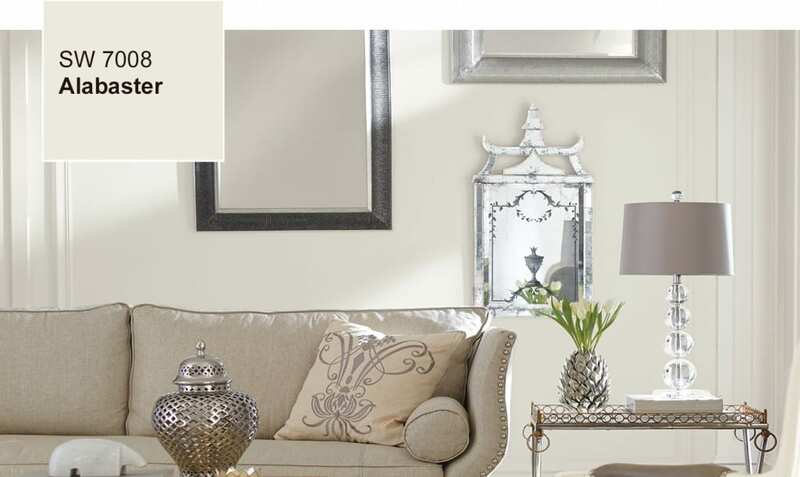 Another oasis of calm is created by the Glidden paint company’s 2016 Color of the Year: Cappuccino White. The creamy off-white creates a soft and relaxing atmosphere, as you can see in this traditional San Francisco living room. It is always great to get design inspiration for using classic whites, and these pure tones will work on walls in any room of the house and with any decor style. Wood furniture always looks great against painted white walls but sometimes people like to choose white furniture too for some white walls. This continues the visual flow and sense of spaciousness. For example, this new white Jonathan Charles French Country Farmhouse cabinet will look very elegant on a white or other pale wall. 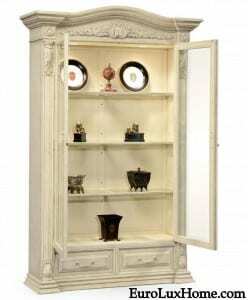 Even though the china cabinet is a stunning 7 feet tall, the white painted wood keeps the airy feeling going in a white room, and the glass doors add to the lightness. Browse all our white new and antique furniture for more bright white ideas! This entry was posted in Home Design Ideas and tagged color palette, color trends, creative home decorating, design inspiration, interior decor, interior design, neutral colors, neutrals, paint color, white decor on December 28, 2015 by admin. Things We Love: New Container of Antiques for Christmas! Christmas came early at EuroLux this year! 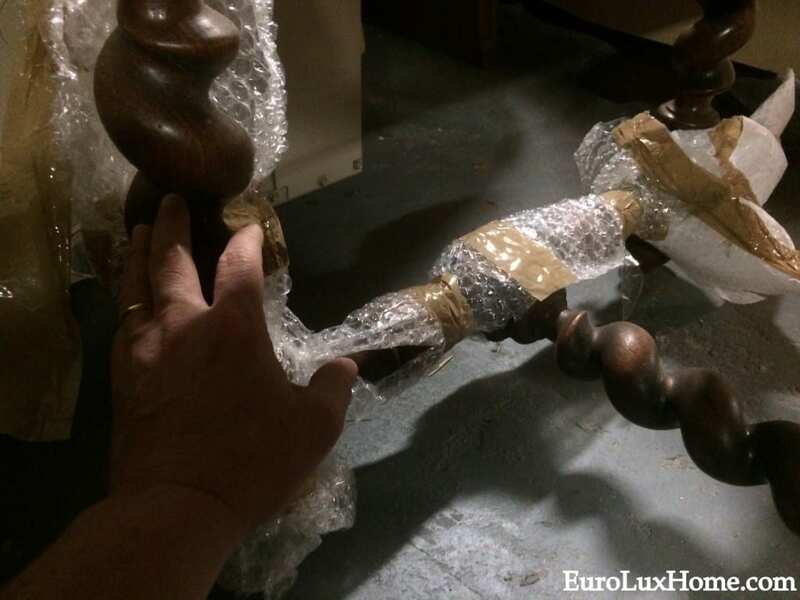 When a new container of antique furniture from France lands with us, it is like Christmas – and this time, it happened at Christmas! We’ve been waiting with excitement for our latest selection of vintage and antique furniture to sail its way across the Atlantic ocean and finally the boat arrived. It quickly cleared customs and we were told the container was on its way to us for the final leg of its long journey. 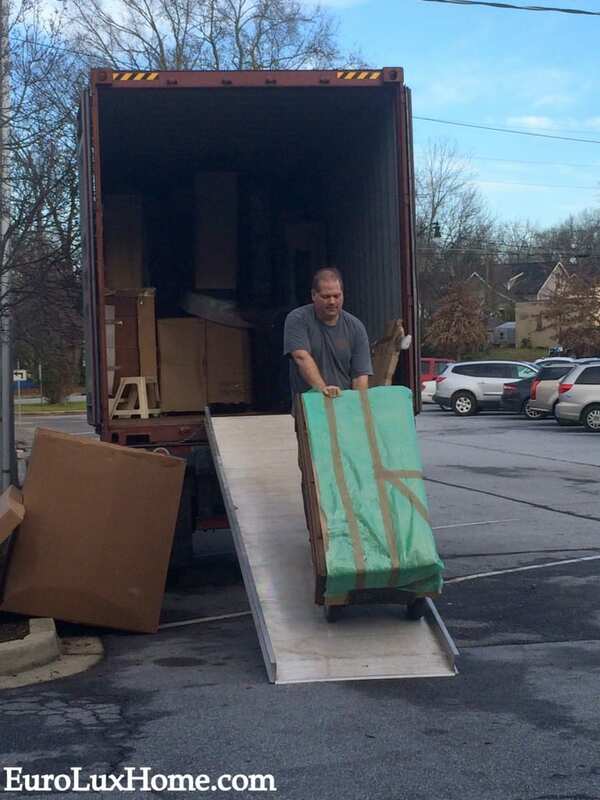 The 40-foot container arrived as promised and right on time at 8 a.m.
We were ready to start unpacking and it took four of us about three and a half hours to unload it – I think that was a new record for us! We had quite a few sets of French antique chairs arriving on the container. At a rough calculation, I think we bought about 45 chairs in all. 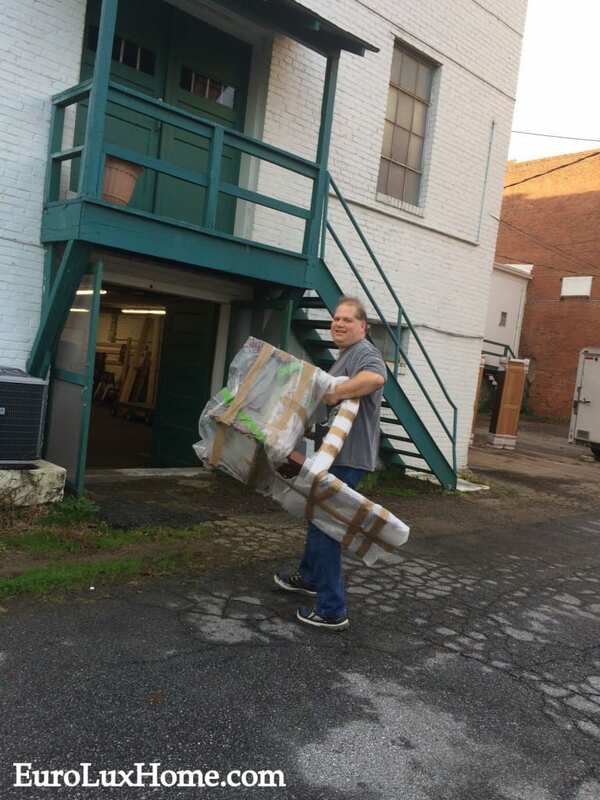 Here’s Greg carrying one of the chairs inside, He’s still smiling at this point. One chair down, another 44 to go! While Greg, Frank and John Earl finished carrying all the furniture off the container, I set to work unwrapping everything. 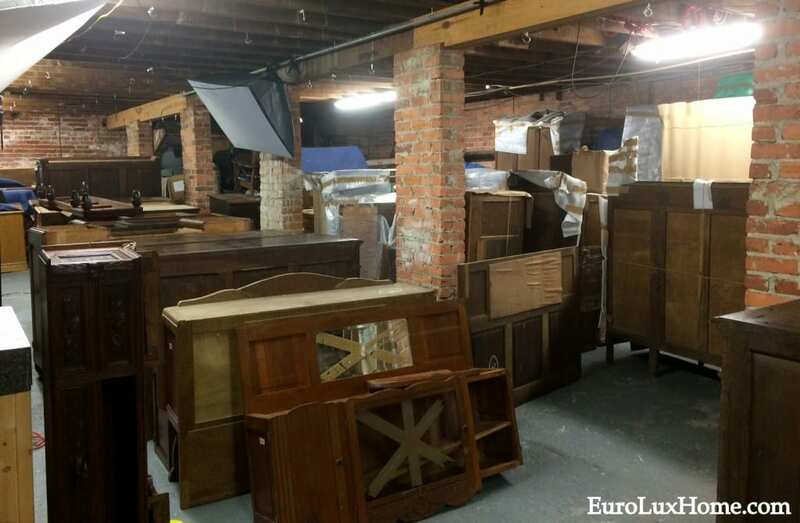 It actually looks like an antique explosion happened because all of the large furniture comes apart in pieces and each piece is meticulously wrapped in bubble wrap, corrugated cardboard and tied with twine. We put in a full day’s work, but it will take another two weeks to get it all unwrapped, cleaned, waxed, and rebuilt in the EuroLux Home Gallery. We’ll tell you more later about the amazing pieces we received including some fabulous Art Deco buffets! But for now it will have to wait because it really is Christmas week! At time of writing, Greg and I are sneaking off to our favorite getaway for a few days of much-needed R & R and then we’ll spend the rest of the week with family. I hope you enjoy your holidays too! 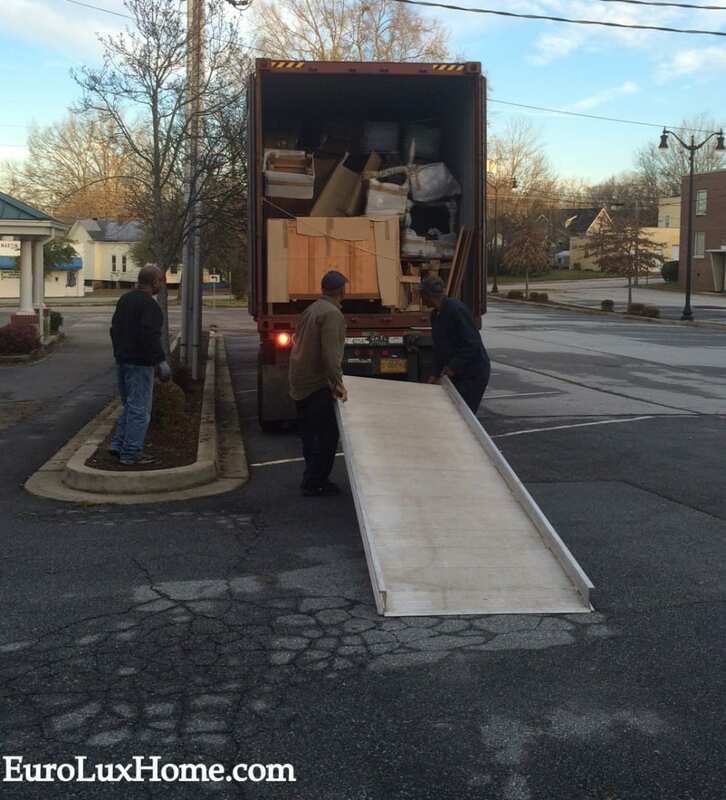 This entry was posted in Antique Furniture, News and tagged antique French furniture, Antique Furniture, Antique Furniture Container, Buying French Antiques, new container, Shipping Antiques from Europe, Unloading Containers on December 23, 2015 by admin. Downton Abbey fans will already know that the popular English TV show is back for its sixth and final season soon, starting on January 3, 2016 on MASTERPIECE on PBS. The very last show in the series will be a Christmas special! But if you want your Downton Abbey Christmas fix now, I’ve also heard that PBS is re-airing the Christmas special finale from Season 5 on December 27, 2015. There’s something nostalgic about an old-time English Christmas. I guess it must be all those Masterpiece Theatre shows as well as holiday stories like A Christmas Carol. 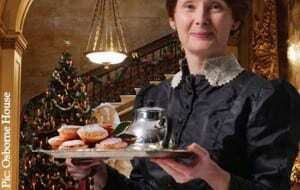 Here are some of the English Christmas traditions that stand out to me. An English Christmas dinner table is always set with Christmas crackers – NOT a food but the novelties that pull apart with a bang. They’re ‘cracked’ before Christmas dinner and the person who “wins” by keeping hold of the longest piece gets the prizes inside. They put on the paper crown and tell the (usually terrible) joke. Once everybody has a paper crown, the feast can commence! 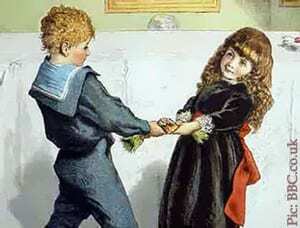 This illustration of two children tugging on a cracker dates back to 1878. The English Christmas meal is very similar to our own, except redcurrant jelly might replace cranberry sauce and roast parsnips are traditional too. Turkey is a favorite although in medieval England a roast peacock or wild boar might have been on the menu! King Henry VIII was the first English King to tuck into turkey for Christmas. Many families add a Yorkshire Pudding to the meal. This is not a dessert but a savory dish between an American biscuit and a savory pancake. 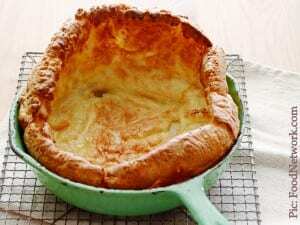 If you want to try this tasty treat, here’s a recipe for Yorkshire Pudding. 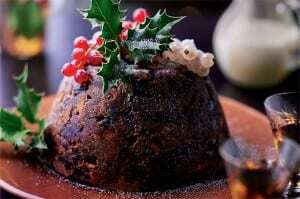 After the meal comes the ‘real’ pudding: Christmas pudding or plum pudding. Except that it’s not a pudding in the way we understand a pudding either! Instead of being a custardy dish, it’s more like a dense steamed cake, full of dried raisins, cherries and other dried fruit and nuts. It’s traditional to hide a silver coin (in the old days it was a silver sixpence) inside the pudding. It’s good luck for whoever finds it in their bowl. Sometimes the pudding is doused in brandy or rum and then set alight as it is carried to the table. It is served with custard, rum butter, clotted cream, or a brandy sauce of thick cream with a few spoons of brandy stirred in. For snacks between meals or to accompany a pot of tea, everyone loves mince pies! Even if you don’t have servants to bring you mince pies on a silver tray, they are easy to make if you find a jar of the mincemeat in your local grocery store. Despite the name, there is no meat involved, although when the delicacy first appeared in the 13th century it was indeed real meat, seasoned with dried fruits and spices including cinnamon, cloves and nutmeg. Now the meat has gone and just the sweet stuff remains, although suet is a part of the mix. If you don’t eat meat, look for products with vegetable suet rather than lard suet. Finally, the English take Boxing Day, December 26, as a national holiday as well as Christmas Day itself. It has nothing to do with the sport of boxing, although there are lots of sporting events on Boxing Day including horse racing. It is actually the day that people traditionally gave gifts (or boxes) to their servants and tradesmen. Nowadays most people don’t have servants but they still celebrate the day as a chance to visit friends or extended family and exchange gifts, or just relax and eat more mince pies! This looks like a very grand and festive place to entertain visiting friends. It’s a picture of the Christmas tree at Holker Hall in Cumbria, England, the ancestral home of Lord Cavendish. Even the bust of the Greek poet Homer on the mantelpiece over the fireplace is decorated with a mistletoe wreath! If you’ve enjoyed reading this, you might also like my post on Old World Christmas Traditions in France and Italy, or the one about Downton Abbey Kitchen Style. 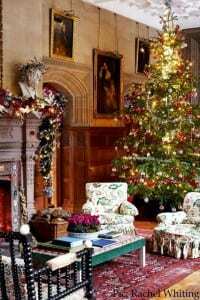 This entry was posted in Food, Holiday Fun and tagged Christmas, Downton Abbey, England, English food, holiday, holiday cooking, holiday decor, holiday table, Traditional cooking on December 23, 2015 by admin. 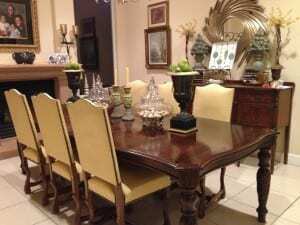 I know that many customers who appreciate our fine French antique furniture also enjoy French food and lifestyle. As the holidays are upon us, I thought you might like to see some recently published books about French cooking by American expats who are living the French lifestyle. They’ll make great stocking stuffers for the Francophiles in your life. You could also pair a book with some antique or vintage kitchenware from our gallery! This is the latest book by Susan Loomis who is well-known for her earlier memoir On Rue Tatin: Living and Cooking in a French Town. Her new volume In a French Kitchen mixes 85 recipes with stories about the American author’s friends and neighbors in her adopted town of Louviers in France. 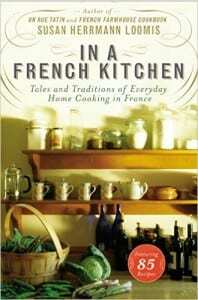 She also shares lots of tips about cooking at home in true French style and without a lot of fuss. Recipes like Braised Asparagus with Herbs look like they are simple to prepare but very delicious. Chapters on French breakfast, dessert, cheese and bread are sure to make the mouth water! Mmm… just the dish on the cover makes me hungry and a copper pan is always so handsome to look at. Food blogger David Lebovitz shares 100 French-inspired recipes that the author has gathered and created since moving to Paris more than a decade ago. 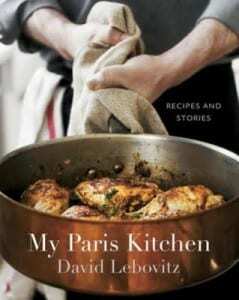 The book is illustrated by photos of Paris and of the author’s own kitchen. Although he does write and reinvent some of the classics of French cuisine, he also gives more unusual recipes to reflect the way modern Parisians eat today. For example, Dukkah-roasted cauliflower, salt cod fritters with tartar sauce, and an exotic wheat berry salad with veggies and pomegranate. 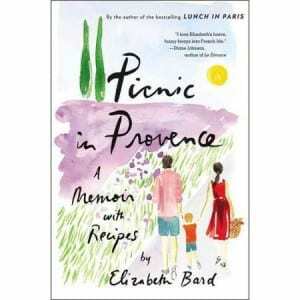 The author Elizabeth Bard is a New Yorker but she’s lived in France long enough to write the popular book Lunch in Paris and now she’s following up with Picnic in Provence. The memoir is about Elizabeth moving from Paris to Provence with her husband and their infant son. There, among the acres of lavender fields, they start their own artisanal ice cream shop with unusual flavors like honey & thyme, olive oil and saffron. As you can guess, the book has plenty of recipes inspired by the culture and countryside of Provence. Now we are all hungry, aren’t we? I can’t think of any recipes to offer you like the French cooking described in these books, but if you want some good all-American recipes for the holidays, we shared some favorites in our post on Christmas Cookies and Franklin Nut Cake. Bon appétit! This entry was posted in Bookshelf, Food and tagged cookbooks, French food, French recipes, recipes, Traditional cooking on December 11, 2015 by admin. 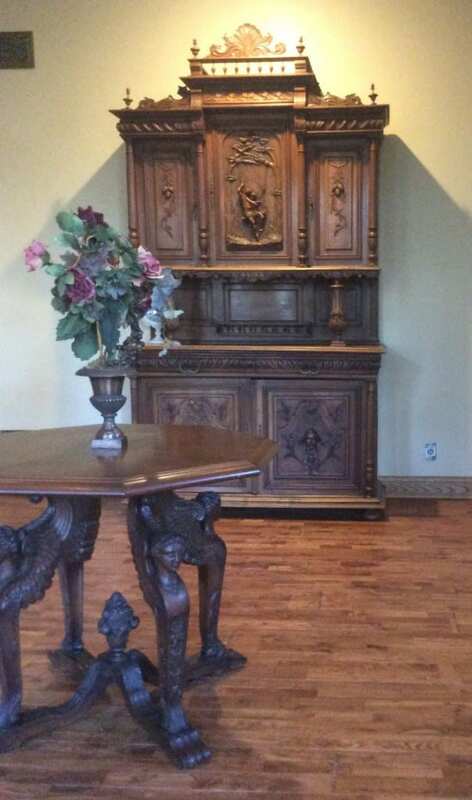 My favorite posts each month are always our client spotlights when we take a little tour of a customer’s home and see how they use the piece of furniture or decor that they bought from us. Last month was no exception as we visited Crystal B.’s Georgia kitchen to deliver a large 1950s vintage French dining table. Crystal has been hunting for the perfect table for her spacious open kitchen for 4 years and we were thrilled that this chunky Renaissance style table was the solution! See the full story and more photos of the vintage Renaissance table as well as Crystal’s lovely wrought iron pot rack packed with vintage appeal. Talking of vintage appeal, we got a great response on our Facebook Page and other social media to our post about Kathy’s collection of Thanksgiving pilgrims. My mother-in-law has collected pilgrims and other Thanksgiving-themed objects for more than 30 years and her collection has grown to more than 700 pieces! We display this wonderful collection in our EuroLux Gallery window on Main Street, Newberry, SC, from October through Thanksgiving every year. People love seeing the pilgrims peeking out of our window! My Collection of Thanksgiving Pilgrims post tells you how the collection started and shows more photos. Visitors often come to stay through the holiday season so I started a series of posts about how to create a gorgeous guest room. The photos are SO inspiring and I hope that the posts help you think about how to make the guest bedroom inviting, comfortable and practical for your dear family and friends. So far I’ve written two posts on this subject. 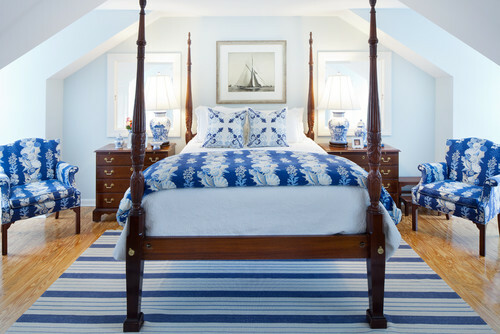 One was about the essentials needed for a Beautiful Traditional Style Guest Room. The other focused on Stylish Seating Options for a Guest Bedroom, whether you have tons of space or a more compact nest for your visitors. I hope that you find some useful home decor ideas or inspirational images in these recent highlights from our blog. Please come back and see us next month or sign up to receive blog posts by email. Let me know if there is a subject you would like me to write about… we love all comments and questions! 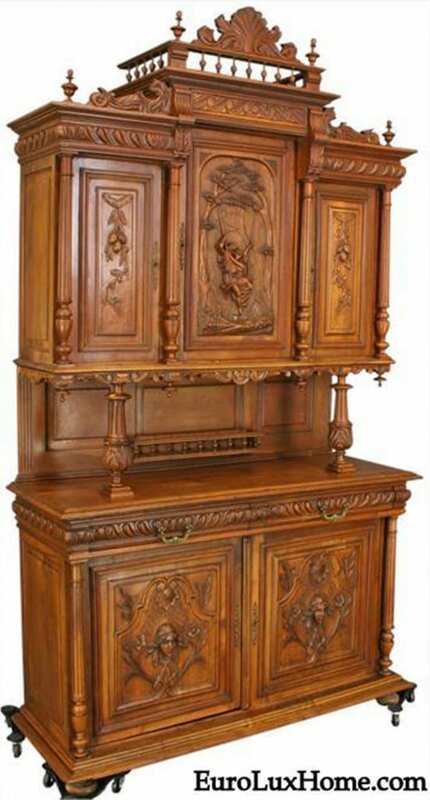 This entry was posted in News and tagged 1950s vintage, Antiques Blog, creative home decorating, design inspiration, European Antique Furniture, French Antique Furniture Blog, home decor, Thanksgiving, vintage on December 3, 2015 by admin. 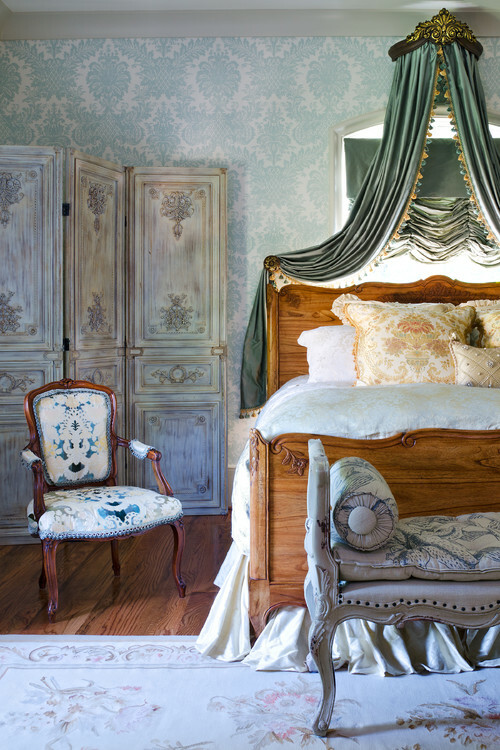 Yesterday I shared some ideas on how to create Beautiful Guest Rooms in Traditional Style. That post focused on the essential furnishings that every guest needs for an overnight stay. 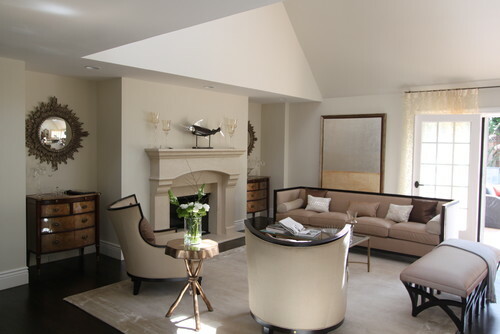 Today I’m going to look at practical and stylish seating choices for a traditional guest room. 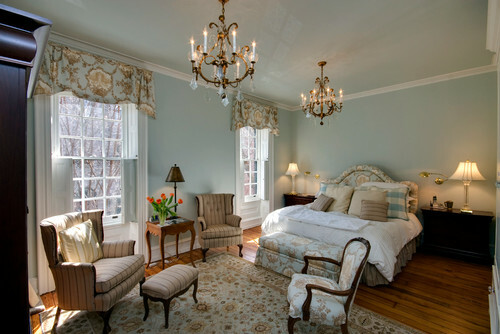 This guest room in Philadelphia is large enough for a separate seating area away from the bed. If you are lucky enough to have a generously proportioned guest room too, it is nice for your visitors to have a private corner to relax, read, or chat on the phone away from the main living area. If you don’t have the space for a whole seating area, then a cozy arm chair or other comfortable chair will still be much appreciated. 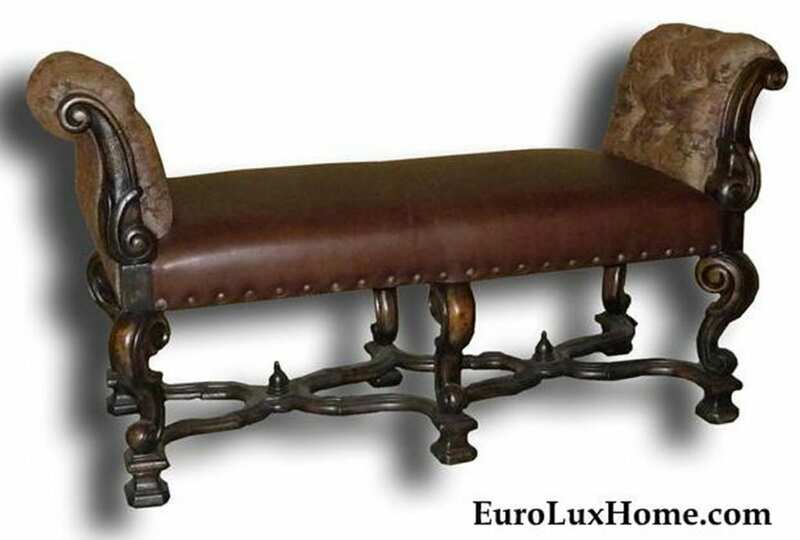 At the very least, it’s good to try to place an attractive traditional bench or ottoman at the foot of the bed. It helps the bed look more ‘finished’ as well as providing some seating. The old chest in this photo looks wonderful and it cleverly doubles as storage. 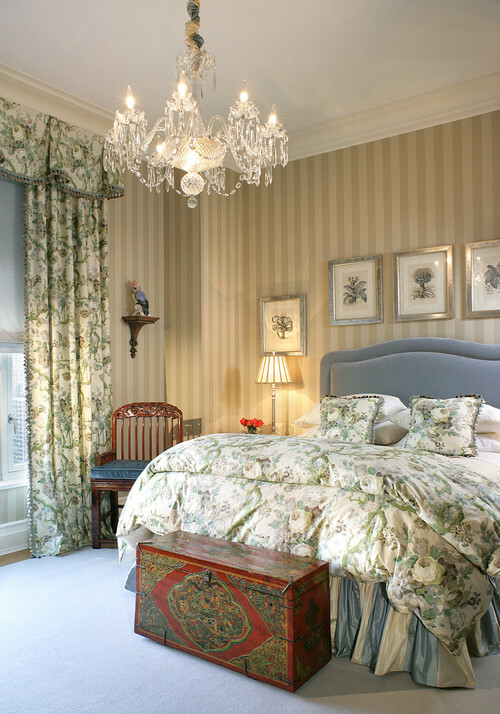 The Antique French Baccarat crystal chandelier is also a stunning addition to make a visitor feel very special. Funnily enough, I’m pretty sure we have that charming wall bracket or one very similar in our selection of Chelsea House wall brackets and display shelves! We have some nice storage seating in the gallery that would work very well at the foot of the bed. For example, this handsome Sarreid leather trunk bench is one of the company’s most popular pieces, and you can see why! 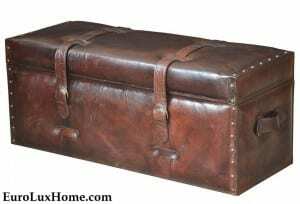 The trunk is 18″ high, so it’s a good seating height similar to an ottoman, and it is crafted in buffalo leather, wood, iron and brass. 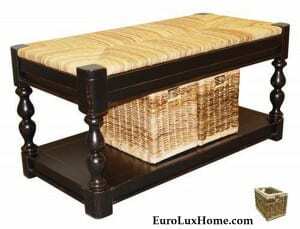 The sturdy trunk bench has an antiqued finish and it’s a fun addition to a guest room as it creates a traveler theme for your friends passing through on their journeys. While a trunk bench is great to stash extra blankets, something like this handsome new bench with an antiqued finish provides a different kind of storage. Convenient baskets beneath the seat can be used for toiletries or your guests’ bits and pieces. The versatile baskets are easy to pull out and use in many ways during a stay. If you have ample storage and dressers already, then a sweet little bench at the foot of the bed still gives your guests a place to perch for a few peaceful moments. 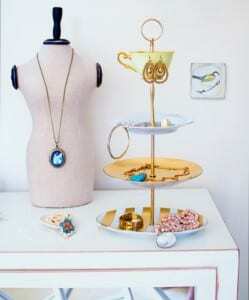 Or maybe it will serve as a tray or display surface sometimes, as in this photograph with a tea set on the bench. That would be a pleasant welcome after a long journey, wouldn’t it? 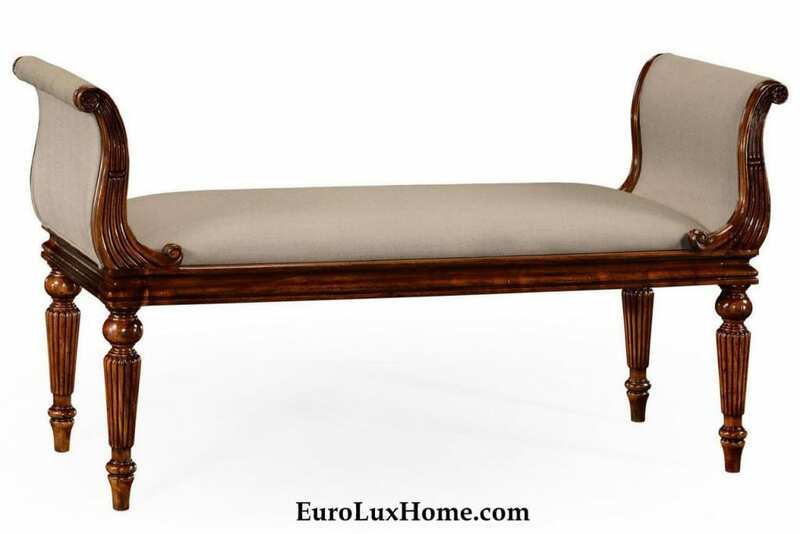 This elegant walnut Jonathan Charles bench from the Country Farmhouse collection has a similar look. The high scrolling arms make a graceful silhouette to frame the bed. So many choices! But whatever chair or bench style you like, your visitors will thank you for the time and thought you put into choosing seating for the guest room so they don’t have to sit on the bed all the time! If you’ve enjoyed this post on guest room seating, also get inspiration from the fabulous guest rooms featured in my post on Beautiful Guest Rooms in Traditional Style. 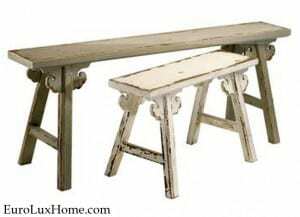 This entry was posted in Entertaining and tagged bedroom chair, bedroom decor, bedroom furniture, bench seating, Farmhouse Style, French Country, guest room, luggage trunk, seating with storage, storage bench, traditional home on December 2, 2015 by admin.